Type III 41/.0100 Stranding. Nominal OD .374 inch. Maximum Continuous AMP Rating, 35 AMPS. Construction: Tinned stranded copper insulated to meet SAE, ABYC, UL and Coast Guard requirements, SJTOW 300 volts, 105*C. (Water Resistant) Various insulated single conductors are extruded together, in parallel with a tough PVC jacket with no air space. 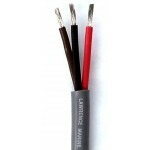 UL 1426 Marine Grade Boat Cable. 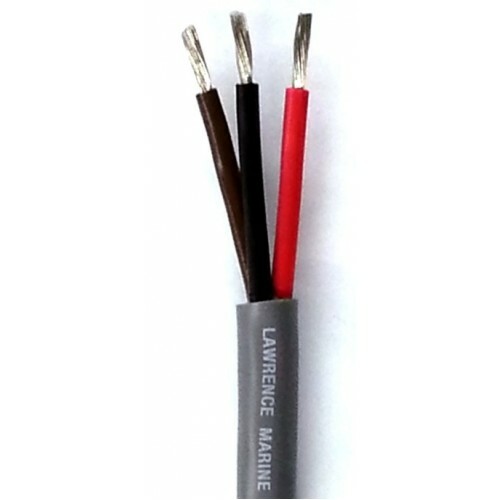 Designed to meet the requirements of Underwriters Laboratories, Inc. for boat cable 105*C dry, 60*C wet, (BC-5W2). Also meets the Department of Transportation Coast Guard specifications "Boats and Associated Equipment" safety standards for electrical and gasoline fuel systems CFR 33 Part 183.